Pectin - What it is, how it works, how to use it, the different types if pectin and where to get it! Pectin is a naturally occurring substance (a polysaccharide) found in berries, apples and other fruit. When heated together with sugar, it causes a thickening that is characteristic of jams and jellies. Your grandmother probably didn't use pectin. Instead she stood over a hot, boiling pot, stirring and getting splattered by hot jam until she cooked the vitamins out of it and it finally cooked down to a thicker consistency. You can also make your own pectin. Just see this page for directions. And if you are just looking for the best prices and all the options for pectin, click here! You can make your own pectin if you wish.. but I'll use the prepared pectin - it is completely natural and safe. It is an extract from apples (with a tiny amount of citric acid and dextrose as binders) and doesn't change the flavor a bit. It just helps thicken, allows you to use less sugar and less cooking! So unless you have a severe corn or apple allergy, there shouldn't be anything unsafe nor unnatural about it! And there are demonstrated health benefits to pectin, see this page. Most pectin you buy at the supermarket is produced in Europe and imported to the U.S.. It has a limited shelf life; usually you don't want to keep it from year to year, as it's ability to gel will decrease. After the jam has been heated and starts to cool, a gel starts to form. If gel formation is too strong, due to way too much pectin, the jam becomes stiff, lumpy or granular in texture. Cooking too long, but not at a high temperature, can boil off water, without breaking the pectin down. This results in jam that is too stiff. This also occurs if the temperature is too high, for too long, or the jam is not stirred frequently. Using underripe fruit, which has more pectin than ripe fruit, with the same amount of pectin as the recipe requires for ripe fruit, also makes stiff jellies and jams. FYI, commercial pectin is intended for use with fully ripe (but not overripe) fruit. Undercooking (it must hit a full rolling boil for ONE minute) or too little pectin or sugar leads to runny jam. Overheating - that is too high temperatures or uneven heat distribution builds excess heat which causes the pectin to break down. This is why you shouldn't double batches - due to inherently uneven heating of home cookware - commercial canning equipment is design to heat more uniformly. See this page for step by step directions on how to remake runny jams and jellies. "high-ester pectins at soluble solids content above 60% and a pH-value between 2.8 and 3.6, hydrogen-bonds and hydrophobic interactions bind the individual pectin chains together. These bonds form as water is bound by sugar and forces pectin strands to stick together. These form a 3-dimensional molecular net that creates the macromolecular gel. The gelling-mechanism is called a low-water-activity gel or sugar-acid-pectin gel. In low-ester pectins, ionic bridges are formed between calcium and carboxylic acid of the galacturonic acid. This is idealized in the so-called egg box-model . Low-ester pectins need calcium to form a gel, but can do so at lower soluble solids and higher pH-values than high-ester pectins." Effectively, pectin's structure binds with water in an acid environment. Sugar increases pectin's ability to gel, and affects the texture and consistency of jellies and jams as they cool and set. Note: sugar is not key to the preservation of the jam - the sterile environmental and acidity are more important. 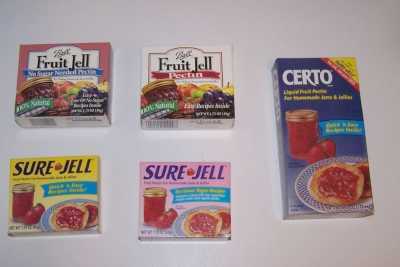 Pectin concentrations vary in fruit. Group I: If not overripe, it usually has enough natural pectin and acid for gel formation with only added sugar. Group II: Low in natural acid or pectin, and may need addition of either acid or pectin. Group III: Always needs added acid, pectin or both. * Raspberries are always identified by researchers as low in pectin. But many home jam-makers have found they often behave as though they have high pectin levels. I usually add a small amount of pectin to raspberries, and get a firm set. The pectin content in all fruit is also generally higher when fruit is just barely ripe and diminishes as it matures from fully ripe to overripe. The process of ripening involves the breakdown of pectins, which softens the fruit as it ripens. Apples and crabapples (especially unripe ones) are good sources of pectin and are often used in making commercial pectin. Some commercial pectin is made from citrus peels. There is a test that uses rubbing alcohol to provide a rough indication of the amount of pectin in the fruit. Mix 1 teaspoon of cooked, cooled crushed fruit with 1 tablespoon of rubbing alcohol. Use a closed container and shake gently. Juices from fruit that is high in pectin will form a solid gelatinous lump. If the fruit is low in pectin, it will form only small rubbery particles. Those with an average pectin content will form a few pieces of the jelly-like substance. See this page for more detail lab tested pectin levels. It ought to be needless to say, that just as you should never put a cup of very hot coffee in your lap while driving a car, you should not eat the test mixture (that with the rubbing alcohol in it) as rubbing alcohol is a poison. Cookbooks from 50-100 years ago often have recipes for extracting pectin from apples for use in other jams and jellies. You may have noticed that old jam recipes often include some lemon peel for the pectin content, and jelly recipes from the pre-SureJell and Certo era are usually essentially apple jelly with other fruit for flavor. Aside from blackberries, few fruits have enough pectin to make self-jelling preserves unless you cook them forever and add loads of sugar..
How much pectin to use? Pectin needs the proper ratio acidity and sugar to make the jams or jellies set. As pointed out at the top of this article, these proportions vary according to the fruit you're using. Using the recipes I've provide, and the proportions of pectin and sugar listed in the specific instructions that come with the particular pectin that you use, gives a much higher quality jam than if you just wing it. This page explains more about how much pectin to use. If your recipe calls for 1 pouch of liquid pectin, you can use dry pectin instead. The average dry pectin comes in a box with a 1.75 ounce (49 grams) packet. This is the same as 1 pouch of liquid pectin. If you have bulk dry pectin, 1 packet is slightly less than 1/2 cup in volume. So, a little less than 1/2 cup of dry pectin equals 1 pouch of liquid pectin. The pectin comes in several types: I prefer the no sugar variety, since many people are trying to cut down on their consumption of processed sugar, AND you can use it with OR without sugar or other sweeteners! Liquid, in jar or packet already dissolved More expensive, messier, doesn't keep once opened. Dry, regular pectin None Makes jam with a LOT of added sugar in it. Dry, No-sugar pectin You can add no sugar, or add Stevia (in a prepared form like Truvia, it measures same as sugar; if you use another form, you'll need do your own conversion) - or Splenda, if you prefer, , or fruit juice or just a little sugar, as you wish, and the mixture will still make a firm jam. If you use NO sugar at all, the jam isn't as bright and the texture is a bit more runny. But add just a little sugar or fruit juice and it is fine. None - old fashioned way to cook down the jam until it is thick no cost for pectin, but .. Must add more sugar and cook much, much longer. Yield and nutritional value are reduced due to overcooking and reduction from evaporation. Freezer jam pectin No cooking involved You MUST store the jam in your freezer or fridge. And it doesn't always set (gell, firm up) well. (one brand is Pomona Pectin) Does not require any sugar; it uses calcium to jell the fruit. Best for Pepper jelly and Mint jelly. You can use low-calorie and no-calorie sweeteners like Stevia, (or if you prefer, Splenda), Aspartame or Xylitol with it. Pomonas Universal Pectin is a sugar-free, vegetarian, low-methoxyl citrus pectin that is activated by calcium. Since it does not require sugar to jell, jams and jellies can be made with less, little, or no sugar. Some other possible sweeteners are honey, fructose powder, sucanat, concentrated fruit sweetener, maple syrup, agave nectar, frozen juice concentrate, stevia, xylitol, or if you prefer, Splenda, and other artificial sweeteners. Each 1 oz. box of Pomonas Pectin contains a packet of pectin, a packet of calcium powder and a sheet of newly revised directions and recipes. A JAMLINE telephone number is included in case there are any questions. * Concentrated and economical -- each box makes two to four recipes. It works pretty well, especially if you are making no-sugar or sugar substitute jams and jellies. I've noticed the jam sometimes doesn't have the clarity of the other pectins. Modified Citrus Pectin - MCP For making jam, MCP works pretty well. It provides a very reliable set in low and no-sugar jams. I still prefer the more common Dry, No-sugar pectin (above), as I prefer the smoother texture that I feel results compared with MCP. Dietary note: According to the American Cancer Society (note: it looks like this page is no longer online) modified citrus pectin (MCP) is merely an altered type of normal, natural pectin, which, when eaten as a dietary supplement is believed (that word is important) to have some anti-cancer properties. As a supplement, people eat a whole lot more than is used in canning, so there is no reputable authority saying that by using this type of pectin in making jam, you will reduce your risk of cancer. It can be difficult to find locally; I have a link to a reliable online supplier (Amazon), below. Note: ClearJel is a starch that is used in making pie fillings. It is not a pectin, but a unique starch that is safer to use in making pie fillings, like home canning apple pie filling or blueberry pie filling. as it is more uniform for heat distribution. Can't find the Pectin? Our affiliate suppliers ship to all 50 states!